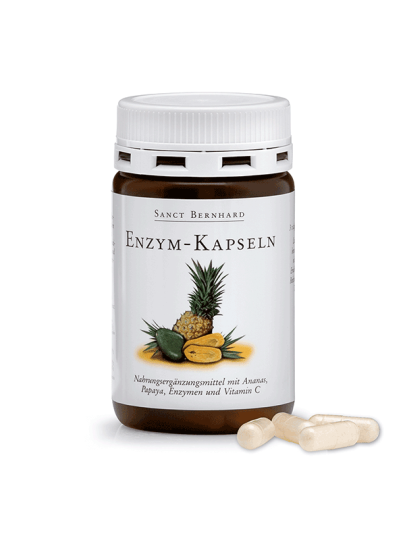 Enzyme capsules contain precious herbal compounds from pineapple and papaya, enzymes: bromelain and papain, and vitamin C. Enzymes are complex protein molecules that our body needs to function properly. Tropical fruit pineapple and papaya, besides being known for their delicious fruit, also contain a significant portion of the enzyme. Vitamin C has a positive effect on the immune system and metabolism and as an antioxidant it helps to protect cells from oxidative stress. Enzyme capsules are a great addition to your daily diet. Each capsule contains 100 mg of bromelain, 100 mg of papain, 100 mg of powdered pineapple fruit, 100 mg of papaya fruit and 75 mg of vitamin C.
Drink 3 times a day with 1 capsule with enough liquid, along with food.